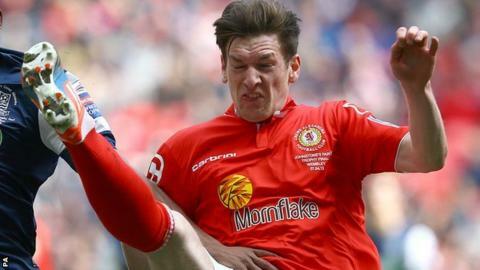 Crewe Alexandra captain Matt Tootle is hoping a players' meeting to discuss their poor start to the season can trigger a much-needed upturn in form. The Alex are bottom of League One without a point after five matches. But Tootle insists that team spirit is still good going into Saturday's local derby at home to Port Vale. "It might seem strange to say it but we've a really good dressing room right now. One of the tightest we've had for a few years," he told BBC Radio Stoke. "You can call all the meetings you want and it doesn't always make a difference, but this one was good. We spoke about how to get ourselves going again. Crewe have enjoyed just one win this season, their 2-0 League Cup triumph at relegated Barnsley back in August. The Alex have lost all five league games, scoring just four goals. In all competitions, they have let in 13 goals in four games at Gresty Road. "All I can put it down to is lack of confidence. "With the derby coming up against the Vale on Saturday too, it's good timing. We're looking to get going again in September." Boss Steve Davis, who is already promising changes from the side beaten 2-0 at Gillingham on 30 August, is also hoping that the enforced international break for his players will have helped to recharge a few batteries. "We have had a busy first month of the season, going Tuesday-Saturday-Tuesday and results haven't gone for us," he said. "But hopefully having that rest will see them ready to go again. "That first month has gone and it's all about looking forward now. That is the thing with football. You have to look forward to the next game and they don't come any bigger than Port Vale for us."